Hi I am a newby to this sight and need some valuable advice.I have a young part bred arab Palomino filly that I am taking to a county show in June.I am also quite new to the show scene. I have reserched dress code etc but am a little confused as what is the correct wear.I think it should be a tweed hacking jacket with trousers can anyone confirm for me. Yes, you could wear a tweed hacking jacket, shirt and tie with trousers really depending on weather, you could go down to a waistcoat. But county, you must wear a hat and have gloves. PBAR's are shown as riding horses, so bridle should be of the traditional leather type with fancy ribbon brow band... often would match your clothing to browband or vice versa. This is really helpfull.As my filly is only 2 can I show her in an in hand arab type in hand bridle.I also have an older gelding who I also try to show in abridle with coloured browband. This is all great at the local shows but I don't want to get it wrong at county level.I think I may try a running plait for her as I know many of the judges don't seem to like seeing the free flowing in part bred arab classes.But at least I should be better equipped now. PS The photo's of your palominos are gorgeous!! Thankyou, the first one is Legend Hawk Moon 4yo; 2nd, Legend Moon Empress 9yo (alias Gem) (full brother and sister...) and third is Gem and Kizzy (Moonlight Princess by Kasadi) who's 3 this year. Time just flies by! This season, we also have 3 Atinska horses in the line-up. Both A. Show Girl and Gem have been scanned in foal to Jacobi (which is our own chestnut purebred stallion by Kasadi), we're wishing the year away now! Any piccies of your little girl? Will look out for you at the BPS nationals then? Yep I did wonder if the judges may feel that way if I did not plait her.Unfortunately the nationals are too far away for me to attend as I am down in Cornwall and it would be a long trek by trailer.I will try and upload my pics at some time soon. My filly's grandfather is Legend Alpine mist and her sire is Mareshal,dam is Sameon silhouette.I also have a 12 year old Palomino gelding who is her Uncle from the same stud who I bought 11 years ago. I am taking scarlett to the Royal Cornwall show this year, a fairly big show for down here so want to make a good impression. Good luck with the foals hope all goes well! Oh gang up and hijack a lorry!!! Lol... Only up the M5 and turn left! With BPS SW show cancelled this year, not many Pali shows in your area eh? Oh, the Sameon horses are lurvely can't wait to see the piccies! Best of luck at the Royal Cornwall! Thanks will let you know how it goes. Counting down the days.And you are right no Pali shows at all down here! !Perhaps I should start one,although no idea what to do! !I will get the pics up one day! Lol... as long as it does'nt clash with HOCON! Margo and Dave, you know you do a great job on the SW show! Oh yes... she's definately hanging on to that foal! So contented, so friendly... soooo catchable! Soooo sorely tempted to put a saddle on her! ? Gem and Hazel would match perfectly in the ridden pairs... and they get on really well in the field too! Great to know who ran the show.Would love to go next year if you hold one.Have to say I don't really know if there are many Pali's down in Cornwall.I don't see many at the local shows!! But would love to take my 2 next year. I have just brought a rising 2 year old pb arab palomino filly and im in Cornwall too. Id love to do the South West pally show next year if its being run. Where was it held? Im down the bottom of Cornwall in Penzance. Im going to quite a few shows but none have pally classes. The Cornish REgion AHS at royal cornwall has a pally class. lorraine- where abouts are you in Cornall? The SW pally show is normally held at Taunton racecourse. That would put you 2.5hrs away. We travel from Gatwick, West Sussex... 4hrs away! ! We've supported the show every year apart from last year, it clashed with HOCON and we had to qualify the purebreds for internationals. There you are, you guys can share transport to the Nationals then?! Yeah! I live just outside Bodmin.Also have the same problem as no paly shows down here.Scarlett is doing the part bred filly at Royal Cornwall,but will be up against all Part bred arabs.I will let you know how she gets on. You've got a youngster too then!! I live in Devon & there weren`t many Pally shows about so I used to show my 2 Pally mares in PBA & Show Hunter Pony classes & used to plait them (either normal or Arab plait) they wore a plain leather filly slip with a nice coloured browband for PBA classes! But had a lovely Arab bridle for the Pally shows ! Theres a Lady in Bodmin who owns a full brother to Theos 2 Legend pallys called legend Moon Falcon , he was entered for Royal Cornwall last year but didn`t show up ! I love Cornwall i often stay down at Indian Queens & i`d move there tomorrow no prob! Hi Holly have you picked your girl up yet ? Thank you for the advice very helpfull!! i am looking forward to the Royal cornwall show will you be going? It is amazing what i have found out since being on here.Have to confess i do not know who it is in bodmin with one of the Legend's i will try and find out now. 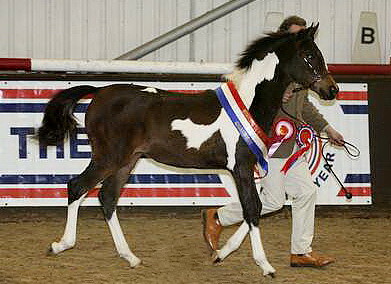 The pics of your pally's are also gorgeous,i really must get some of mine on the site.I also own another sameon but his colour is not as rich as scarletts.I tend to take him to a lot of the local shows but realise i need to plait him up as most are for part bred arab classes and i have been showing him natural but realise the judges are probably not so keen on that.Lesson learn't there!! Anyway must go up to see them soon. Hi there , i`ve been to the Royal cornwall for the last 2 yrs but am not going this year which is a shame as its a lovely show. Maybe L Moon Falcon will be there this year ? The lady who bred your 2 used to post on here alot as SarahW but she hasn`t been on here for quite a while now , she bred a lovely Pally filly last year by H Tobago . Is your gelding by Legend Alpine Mist ? One of mine is a 3/4 sister to Theo`s 2 & her daughter has the same sire as Legend Alpine Mist ! Babs shes a lovely mare ,shes a niece of one of mine & theres a similarity alright ! Her grandsire Colebridge Silver Phantom is lovely & throws really nice stock infact i sent Fantasy up to him without going to see him first ! 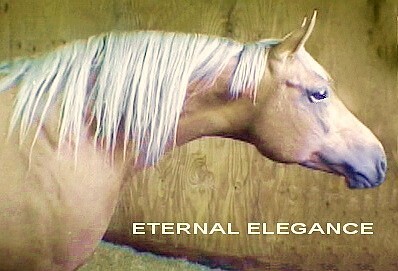 I have a pic of Gems grandmother Fayrelands Elegence in an old Palomino magazine . And her filly is very nice ! i have really started something here all very interesting and all these horses are so beautifull. sarah yes i know sarahw used to post here quite regularly but I have not heard from her in the last couple of months. My Gelding is out of Fayrelands Mountain Mayflower & Chaldensfords Golden Candy who happens to be in the recent Palomino magazine. My Filly is out of Mareschal and Sameon Silhouette with her grandfather being Legend alpine Mist and fayrelands mountain Mayflower. All related in a way and all have very similar looks i think anyway.I need to get some of my photo's up I think. Great to speak to you all!! i`ve seen a couple of his full brothers at the Palomino shows i think you mean his dam is called Fayrelands Golden Mayfly though & not Mayflower ? ?